In the Caribbean, Geotextile tubes and bags are used to dewater numerous types of food processing wastes, such as meat packing, vegetable processing, cheese and wine processing. As an added bonus, the dewatered material can be reused as a beneficial byproduct for its nutrient value. 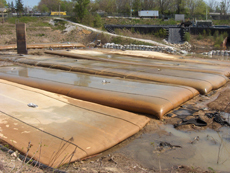 Employing a polymer can help with flocculation of the sludge to help with the separation of solids and the quality of the effluent during the filtration process in Trindad and Tobago, Belize, Puerto Rico and Costa Rica. To learn more about SDMI dba Caribbean GeoTextiles UV resistant, high strength GeoTextile Hurricane Storm Protection products in your next Caribbean project, call us at 770-831-8111 or contact us by clicking here.